This week I picked up my new glasses. Lens grinding being a technology that is about 400 years old, I assumed glasses could be made effectively and a bit cheaper here in Nepal. Last time I was at the clinic for a stomach infection I asked about glasses and was referred to what I was told is Nepal's top optometrist, who gave me a complete eye exam for US$20.00. The good news was that my current glasses were still good; that is, my eyes hadn't gotten worse. My glasses had, though, after three years of daily use, so I decided to order a pair of progressive lenses for everyday use and my first pair of reading glasses. The progressive lenses were ordered from Singapore and I am after three days still getting used to them. The idea with these lenses, if you haven't heard of them, is to allow the user to see clearly at far, middle and close distances by building a lens that gets progressively stronger from top to bottom. In use, this means that you have to get used to looking out of the top, middle, or bottom part of the lens for objects at progressively closer distances to your eye. The first day using them gave me a headache. The last two days have been fine and I find it is easier to get used to using them while stationary than while moving. Walking is particularly challenging, particularly when you want to look at the area around your feet; the bottom part of the lens is for reading and doesn't provide clear focus on the curb, which requires a little extra bending at the neck. Haven't yet much used the reading glasses but look forward to the opportunity to put them to use. I should get a chance to do that next Sunday, when I take a 7-hour bus ride to the Nepal/India border. Oh, and the cost. 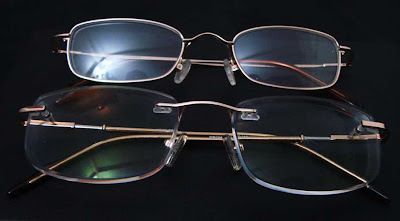 Both pair, including frames, was 10,750NRS, or US$137.00.